Israeli Prime Minister Benjamin Netanyahu addresses the United Nations General Assembly on September 27 in New York City. ‘A central, ongoing figure in the nuclear weapons program’ for decades is current Iranian President Hassan Rouhani. New documents suggest that if Iran abandons the nuclear deal, it has the ability to build a bomb in a matter of months. If Iran restarts its centrifuges, it could enrich enough weapons-grade uranium to build its first nuclear weapon in about seven to 12 months. That’s according to comments David Albright made to Foreign Policy. Albright is a physicist who runs the Institute for Science and International Security in Washington, D.C. 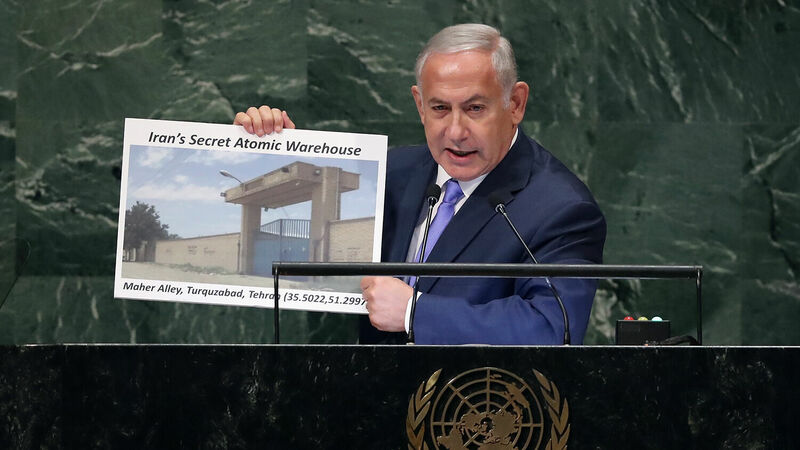 He has visited Israel several times to review files obtained by Israeli agents on January 31 during a raid of Iranian nuclear records in Tehran. The Jerusalem Post reported, “Iran has already overcome some of the obstacles to building a bomb which experts thought it had not yet overcome.” This is despite the fact that Iran signed the Joint Comprehensive Plan of Action (jcpoa) with seven other nations and the European Union in July 2015, the main purpose of which was to stop Iran from producing weapons-grade fuel. Alexandra Bell, a former Obama administration official, said she believes “the jcpoa is working.” But if Iran was adhering to the agreement, then why did this secret archive even exist? Although Iran’s possession of the nuclear archive does not directly break the terms of the jcpoa, by retaining these documents and videos, historical precedent—for example, South Africa dismantling its nuclear weapons in 1989—supports the argument that Iran is breaking its obligation under the Non-Proliferation Treaty. According to Albright’s analysis, by the end of 2003, Iran had managed to build the infrastructure for a “comprehensive nuclear weapons program” intended to produce five nuclear warheads, each with a 10-kiloton explosive yield. Rouhani was also central to the narrative that former U.S. President Barack Obama and his administration used to sell the nuclear deal. The Washington Post reported that Obama adviser Ben Rhodes “helped promote a ‘narrative’ that the administration started negotiations with Iran after the supposedly moderate Hassan Rouhani was elected president in 2013.” In fact, the Obama administration began negotiating with Iran’s leaders and worked on the framework of the agreement before Rouhani’s election. Due to the efforts of the Obama administration and a largely supportive media establishment, Rouhani was made out to be more trustworthy than most Iranian leaders. That simply is not true. President Rouhani is a central figure in Iran’s nuclear development plan and has been diligently working to keep it alive in Iran. One of the most worrying aspects of Iran’s growing power is its flirtation with nuclear weaponry. Iran has had a nuclear program of its own for many years. Information leaks have shown that Iran, while publicly stating that its program is purely for energy use, actually wants other nations to know it could be a nuclear threat. The Bible prophesied of this nuclear disaster in Isaiah 6:11. Cities will be “wasted without inhabitant, and the houses without man, and the land be utterly desolate.” Rouhani’s support for the nuclear program probably never ended, and it is likely he has been diligent in improving Iran’s nuclear capabilities. Now that Iran has the know-how and the capabilities to build a bomb and produce the required amount of weapons-grade fuel, nuclear warfare is becoming more and more probable. For more information about Iran and its strategy to control the Middle East, please request your free copy of The King of the South.